A 5th Edition OGL adventure module for four to five evil 2nd level PCs. The holy decopunk campaign setting of Askis is ruled over by the nine legendary Celestial Heroes, epic adventurers that stamped out evil from the world—almost. In this free adventure module for the Book of Exalted Darkness Kickstarter the players are wicked agents part of a plan hatched by Gespadrieux, a mad scientists lurking beneath the earth. Their sordid party of villainy will strike against not one but two of the Celestial Heroes’ descendants, cracking the impervious fortifications of the paladin Lellwyn Fethyrwal in a daring assassination in the very heart of the city of Legio before effecting a daring escape. The city of Legio, a fully-mapped settlement filled with bustling factories and devout workers! An exciting and despicable adventure in two acts: preparing for the foul deed and escaping capture afterward! 7 holy NPCs to stand in the way of the evil adventuring party! Inaequa Chariots and Inaequa Pistols, the first pieces of decopunk technology that will be included in the Book of Exalted Darkness! Dark rewards for completing the quest including malevolent augmentations for every character class and four grafting feats depending on what each PC chooses as their prize! 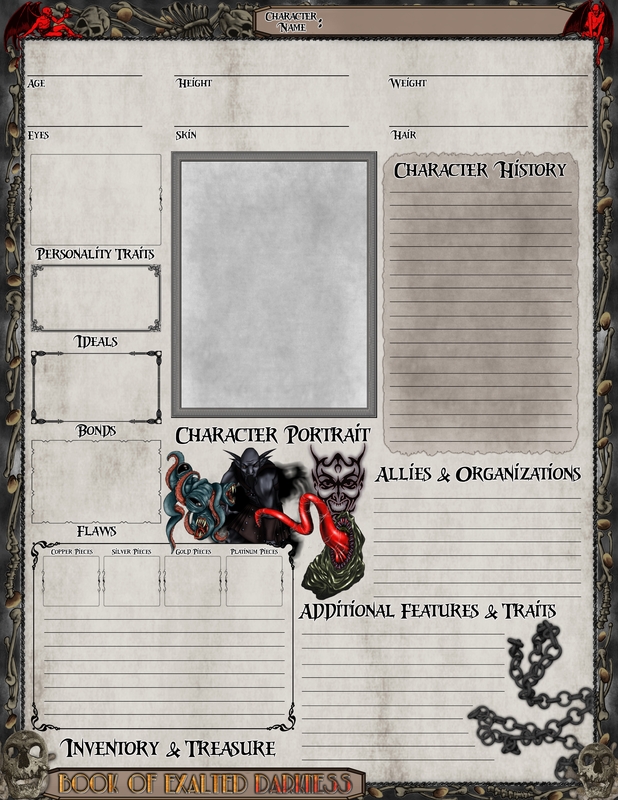 New attributes: Sanctity and Sin, two facets central to the Book of Exalted Darkness through Sin points and the danger of the vilespawn template! 2 nefarious class archetypes: fearmonger sorcerers and masquerading heretic rogues! 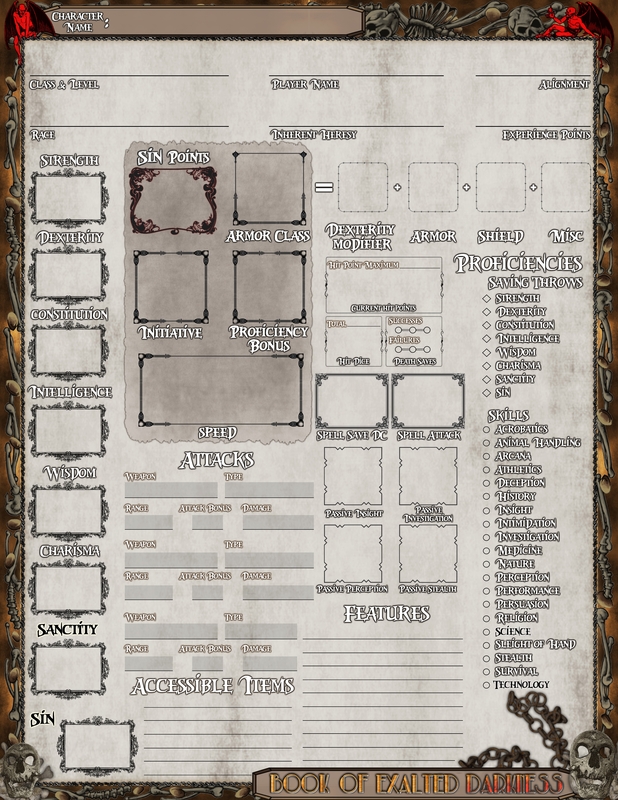 Book of Exalted Darkness character sheets! An evil 5th Edition OGL supplement for wicked players and vile GMs. The Book of Exalted Darkness Kickstarter is set in a holy decopunk world as a backdrop for evil adventurers—and comes with a plethora of despicable, nefarious, and wicked mechanics for them to truly spread corruption and malevolence! The Book of Exalted Darkness: Evil Primer is a preview of some of the playtest material for the book, all of which will be refined by backer-feedback and critique. New attributes: Sanctity and Sin, two facets central to the Book of Exalted Darkness through Sin points and the horrific vilespawn template! 7 Inherent Heresies taken by PCs at character creation, their edge against a world predicated to grind them beneath its heel! 4 Evil Backgrounds (foolish spelunker, inaequa technician, murderer, and unholy witness) to give the group a better sense of the world of Askis! The Science and Technology skills for adventurers keen on manipulating machines to malevolent ends! A bevy of despicable feats! Deformities like Corpulescent and Malformed Basal Ganglia, Sinful Magic and Sinful Slayer for evil mages and warriors alike! The start of the Evil magic tradition with the blood spear, bone spurs, exsanguination, extinguish soul, flay skin, forced hemorrhage, foreboding horror, sanguine razorstorm, and unholy gaze! Vile class options! The Abyssal cleric domain, Feral Barbarian primal path, Gray Knight warlock patron, and Warrior of Dark Chi monastic tradition! Mad scientists are common enemies and antagonists, but why not protagonists as well? Now they can be using the mad scientist class to build dastardly villainous PCs for Fifth Edition OGL! Please let us know what you think about the Mad Scientist Playtest PDF at bookofexalteddarkness|at|gmail.com. Thanks!